How to turn a cheap candlestick into an amazing cake stand - Lovely Etc. I am super excited about this gift idea! 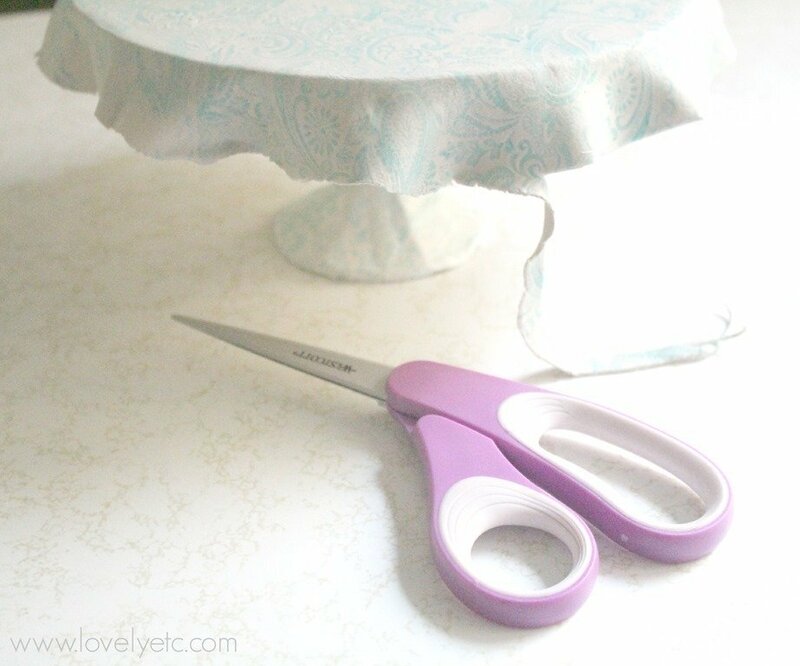 I love to decorate with cute cake stands. They’re not only great for cakes (obviously! ), they’re also fantastic for holding stacks of books, framed photos, seashells, pinecones, candles, pretty much anything. I’ve seen several upcycled cake stand ideas, but I’ve never seen one quite like this one. 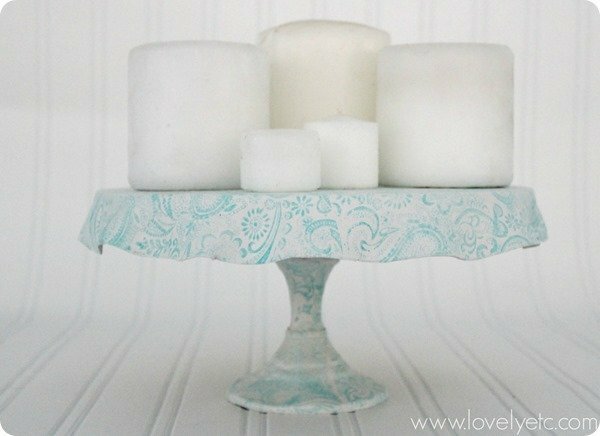 I am so happy with how beautiful this little cake stand turned out. And even better, it was pretty inexpensive and easy to make… but you’d never know it just by looking at it! I wanted to make sure the cake stand was actually sturdy enough to hold something, so I did not make it entirely out of clay. The base of the stand is a small glass candleholder from the dollar store. The top part is a small round piece of wood (you can get these at your local craft supply store). 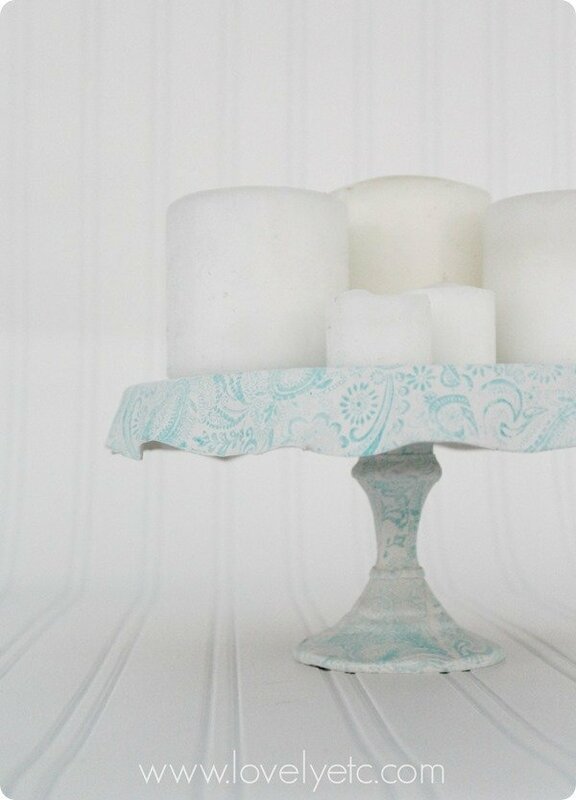 The only tricky part of this entire project was covering the curves of the candle holder smoothly. I found that the easiest way is to cut the clay into strips and wrap the strips around the different sections of the candle holder. 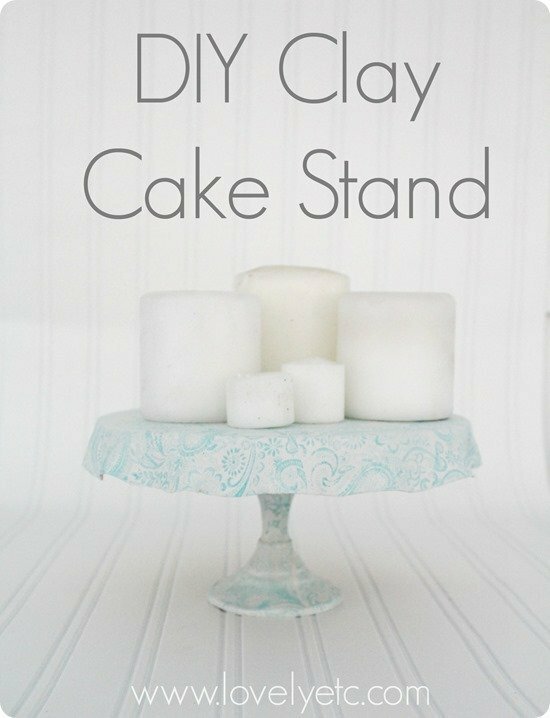 To make the top of the cake stand, I rolled out another piece of clay with the rolling pin. This time I rolled the clay into a circle about two inches larger than my wooden circle. 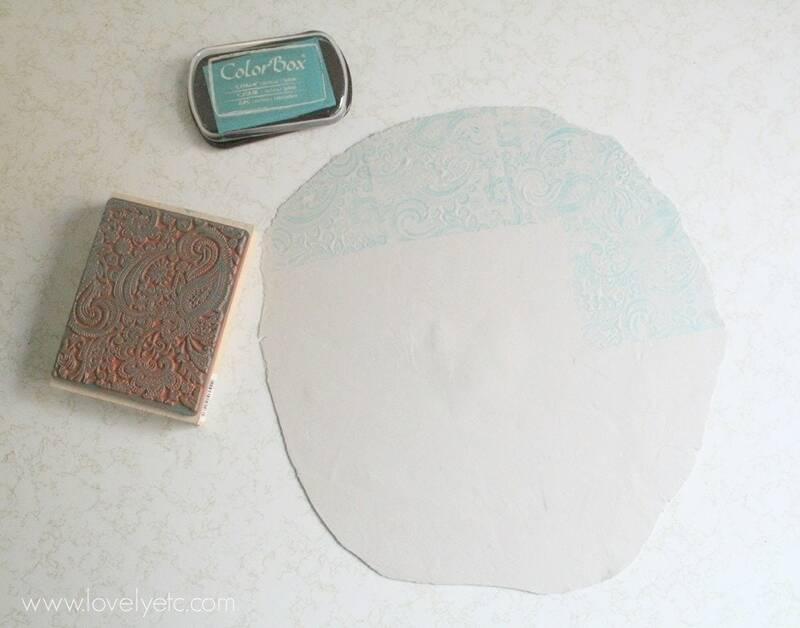 I again used my stamp and ink to stamp the entire circle. I carefully draped the circle of clay onto the circle of wood. I pressed the sides of the clay to the sides of the wood circle; this caused the overhang of clay to gently ripple. Originally, I was planning to cut this overhanging clay off but it was so pretty I had to leave it on! I did trim around the edges of the clay circle with scissors to make everything nice and neat. Once all of the clay was completely dry, I simply glued the top to the base. Personally, I’m loving it as a centerpiece for candles. LOVE the snowflake! After they open the gift they can use it for decoration too! Exactly what I was thinking Shawn! Extremely creative. I love this. Now to just be brave enough to give it a shot. Thanks Debby! You can do it. And really, even if it turns out terribly, you aren’t out much money and you can have a good laugh! Haha! It is ok to be just a little naughty. And thank you so much! Fantastic project! What a great idea to decorate a cake stand with clay! Awesome! Thanks Asia! I am in love with how it turned out! Oh, the cake stand is so creative, love it. And super cute snowflake. Very cute cake stand. I liked the of your color choice. Thank you. Thanks Katie! I just can’t resist a good blue. Oh, this is just GORGEOUS! 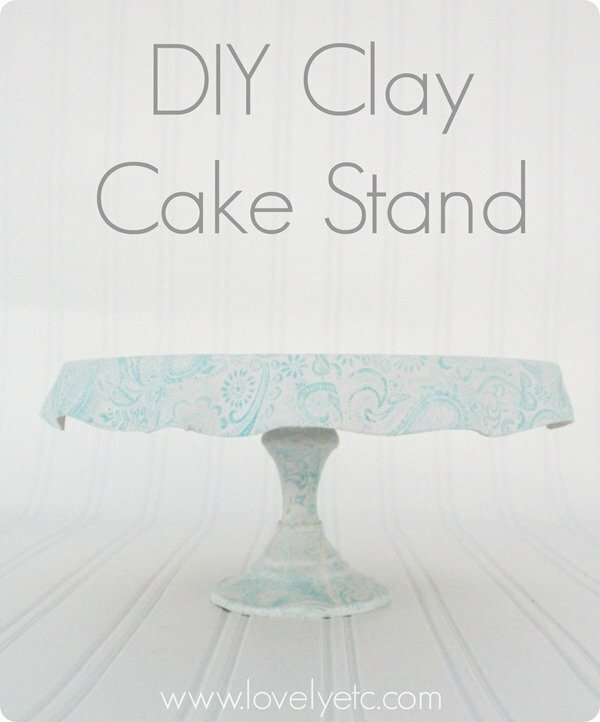 I haven’t worked much with clay and it never even occurred to me that you could make a cake stand from it–what a brilliant idea. Thanks so much for sharing on The Makers! Thanks Amy! I haven’t worked with clay much either but I got this crazy idea and had to give it a try. I’m so glad I did because I love how it turned out! Carrie that’s amazing and soooo beautiful!